However the mechanism behind eruption times remains uncertain as some odontomas erupt at a young age and others at an older age. Eruption of odontomas are most often seen in older people. Thus, it is likely that resorption of the edentulous part of the alveolar process plays a role, but it is also possible that reactive growth of the capsule contributes to this phenomenon. Eruption at a young age is possible through bone remodeling that might have resulted from the presence of dental follicles. We are reporting a case of an asymptomatic erupted compound odontoma in an 18 year young female along with a brief review. An 18-year-old female presented with a chief complaint of presence of extra teeth in relation to right side of the lower arch since 2 years. On examination, along with the normal compliment of teeth, multiple yellowish white teeth like structures were present on the lingual aspect in the fourth quadrant, between the lower right canine and lower right lingually placed lateral incisor [Figure 1]. On palpation, the teeth like structures were asymptomatic, hard and calcified and measured around 5-6 mm in diameter. These calcified structures resembled multiple small teeth and they were non-mobile. There was no erythema, inflammation, ulceration or pain on surrounding mucosa. 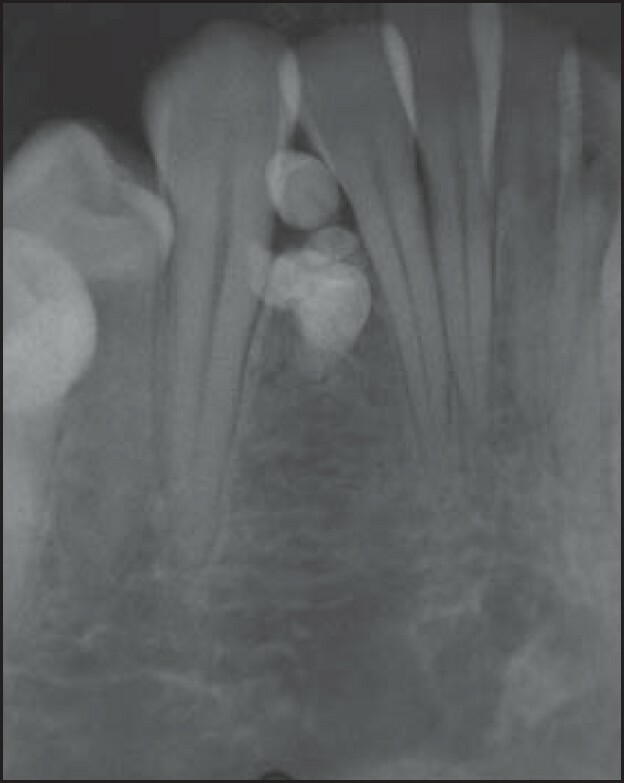 An intraoral periapical radiograph was advised to determine the exact extent of the lesion as well as its relation to surrounding structures [Figure 2]. It showed multiple radiopaque small teeth like structures between right lateral incisor and canine and was not associated with any impacted teeth. They were well defined with smooth periphery, and the internal structure was densely radiopaque with a small radio lucent halo and appearing like a number of denticles or tooth like structures. These denticles displaced the disto-inferior aspect of the lateral incisor and mesio-inferior aspect of the canine, which led to mild crowding of lower anterior teeth. The location of the lesion can be determined clinically as it is lingually present. Based on clinical and radiographic findings, a diagnosis of erupted compound odontoma was determined. The odontoma was extracted under local anesthesia and it showed no resemblance to normal series of teeth. It consists four small teeth like structures (denticles), with small rudimentary roots [Figure 3]. 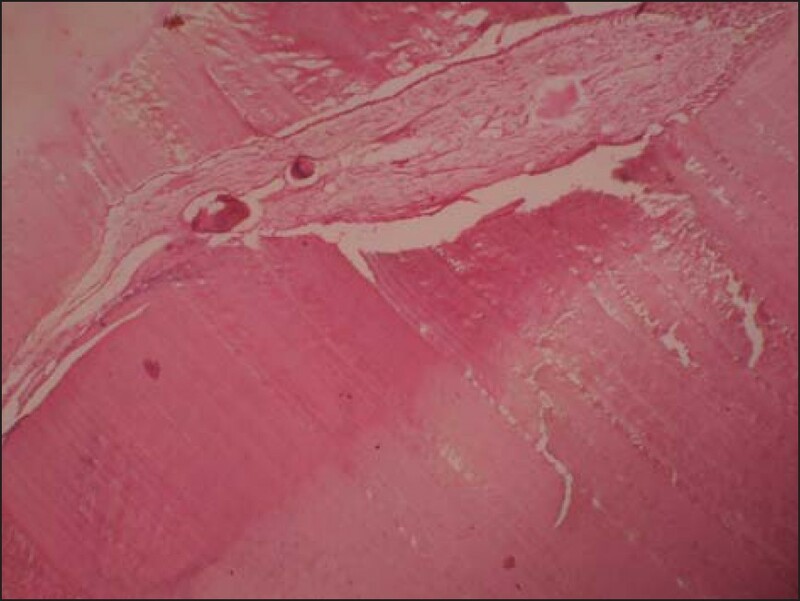 The specimen was subjected to histopatholgical examination, which confirmed the diagnosis of compound odontoma [Figure 4]. Patient was referred to orthodontics department for further management of crowding teeth. These are usually asymptomatic lesions, and in most cases they are associated to alterations in permanent or temporary tooth eruption. Eruption of odontomas is infrequent in the literature. Pain and swelling are the most common symptoms when odontomas erupt, followed by malocclusion. Recurrent infection following the eruption into the oral cavity has been reported. Our patient was asymptomatic, there was no pain, swelling or erythema in surrounding mucosa except for lower anterior crowding and the right lateral incisor is positioned lingually, causing malocclusion due to eruption of odontoma. Compound odontomas are more commonly found in the anterior maxilla while complex odontomas tend to favor the posterior mandible. In our case, the erupted compound odontoma was present in the mandible, which is a rare occurrence. Radiographically, odontoma presents as a well-defined radiopacity situated in bone but with a density that is greater than bone and equal to or greater than that of a tooth. It contains foci of variable density. It is present with a radiolucent halo, typically surrounded by a thin sclerotic line, surrounding the radiopacity. Radiolucent zone is the connective tissue capsule of a normal tooth follicle. Thin sclerotic line resembles the corticated border seen in a normal tooth crypt. Developmental stages can be identified based on radiologic features and the degree of calcification of the lesion at the time of diagnosis. First stage is characterized by radiolucency due to the absence of dental tissue calcification, the second or intermediate stage shows partial calcification and the third or classically radiopaque stage exhibits pre-dominant tissue calcification with the surrounding radiolucent halo described above. 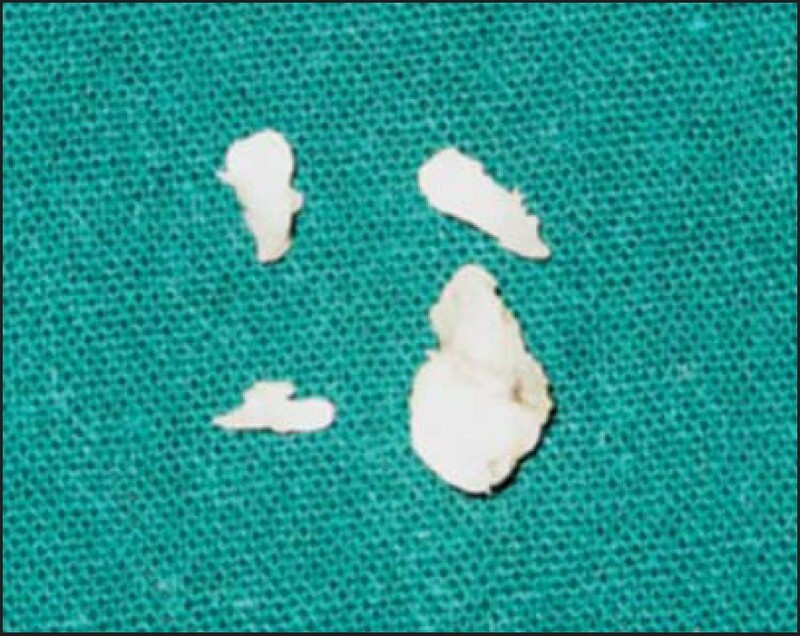 Management of choice is surgical removal of the lesion in all cases. In conclusion, this paper describes a rare case of asymptomatic erupted compound odontoma causing only mild crowding of anterior teeth. Most often such cases are diagnosed as supplemental or supernumerary tooth or vice versa and need to be differentiated. 1. Sales MA, Cavalcanti MG. Complex odontoma associated with dentigerous cyst in maxillary sinus: Case report and computed tomography features. DentomaxillofacRadiol 2009;38:48-52. 2. Isler SC, Demircan S, Soluk M, Cebi Z. Radiologic evaluation of an unusually sized complex odontoma involving the maxillary sinus by cone beam computed tomography. Quintessence Int 2009;40:533-5. 3. Tejasvi M L A, Babu B B. Erupted compound odontomas: A case report. J Dent Res Dent Clin Dent Prospects 2011;5:33-6. 4. Serra-Serra G, Berini-Aytés L, Gay-Escoda C. Erupted odontomas: A report of three cases and review of the literature. Med Oral Patol Oral Cir Bucal 2009;14:E299-303. 5. 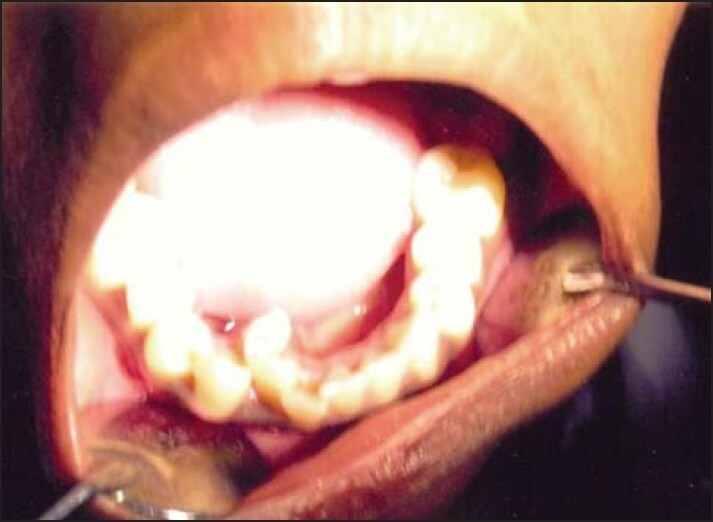 Amailuk P, Grubor D. Erupted compound odontoma: Case report of a 15-year-old Sudanese boy with a history of traditional dental mutilation. Br Dent J 2008;204:11-4. 6. Chandra S, Bagewadi A, Keluskar V, Sah K. Compound composite odontome erupting into the oral cavity: A rare entity. ContempClin Dent 2010;1:123-6. 7. Vengal M, Arora H, Ghosh S, Pai KM. Large erupting complex odontoma: A case report. J Can Dent Assoc 2007;73:169-73. 8. FerrerRamírez MJ, Silvestre Donat FJ, EstellesFerriol E, GrauGarcía Moreno D, LópezMartínez R. Recurrent infection of a complex odontoma following eruption in the mouth. Med Oral 2001;6:269-75. 9. Litonjua LA, Suresh L, Valderrama LS, Neiders ME. Erupted complex odontoma: A case report and literature review. Gen Dent 2004;52:248-51. 10. Junquera L, de Vicente JC, Roig P, Olay S, Rodríguez-Recio O. Intraosseousodontoma erupted into the oral cavity: An unusual pathology. Med Oral Patol Oral Cir Bucal 2005;10:248-51. 11. Giunta JL, Kaplan MA. Peripheral, soft tissue odontomas. Two case reports. Oral Surg Oral Med Oral Pathol 1990;69:406-11.